15th Jan - PCBs back from the fab! This is an attempt to recreate some of the High-Altitude sunrise photos taken by Apex II - Launch 2. I'll be using a small balloon in order to lower the cost and avoid the requirement for a NOTAM. I plan to launch at approximately 45 minutes before sunrise is due at 15km altitude (about an hour earlier than on the ground), and be clear of airspace well before the Southampton Airport opens at 0630 Mon-Fri or 0730 Sunday. Due to high descent speeds, it is possible if timed well enough, that I could recover the photos of the sunrise before I on the ground have experienced it! The lower cost will allow more attempts to get this right, and if I like the result, I'll consider a larger, higher, NOTAMed flight as sunrise gets earlier in the Spring months. 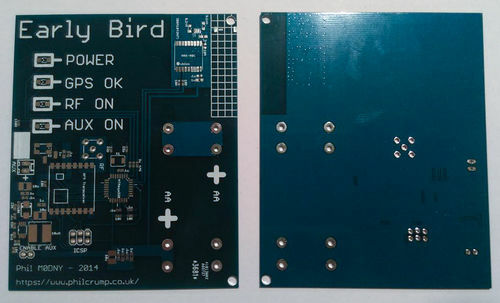 Electronics Parts ordered, initial assembly planned for 24th-25th. Visited SoMakeIt Makerspace to find out about 3D printers, will return on the 13th to print the Camera DC Adaptor. 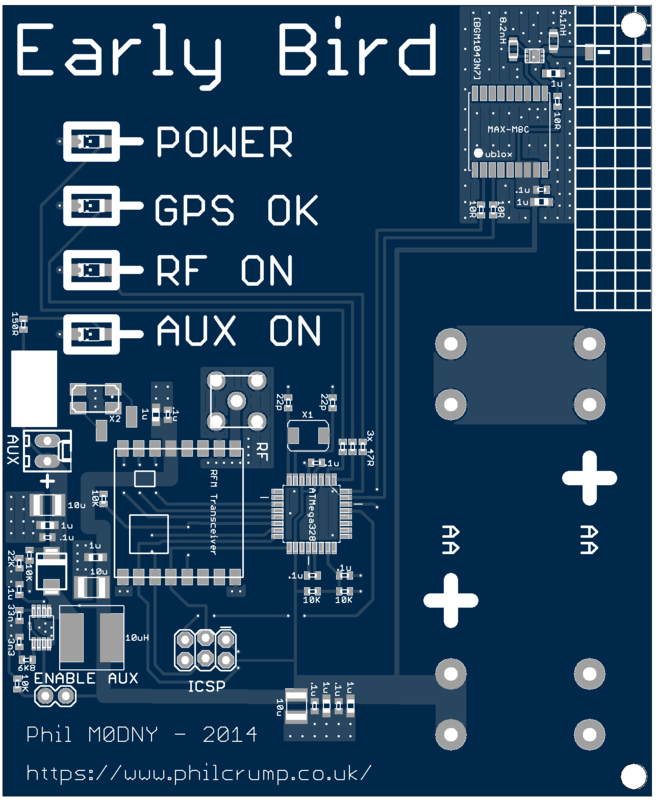 Sent Tracker+Power Supply PCB Design off to DirtyPCBs Fab, expected back middle of Jan 2015. Tested Camera battery in freezer - only 34 minutes! Tested Camera battery on windowsill, 4 hours and 49 minutes duration. The lighter the payload, the less helium I need to lift it, the cheaper the launch will be, and the higher the balloon can get! PCB will take up 8cmx10cm of box area, Camera the other 2cm. Hole cut in side for Camera Lens, and indentation in top to allow for the height of the Camera. Strung on string cradle directly under balloon neck in order to conform to 'pico' balloon regulations. Due to the UK restrictions on Airborne Amateur Radio usage, APRS Tracking is not an option. Instead the 434MHz ISM Band is used, at a power limit of 10mW. Using the RFM98W LoRa Transceiver module means that I can try out the LoRa packet mode that has recently proved popular (Dave Akerman) in UKHAS. LoRa uses a modulation mode described by Semtech as spread-spectrum, to vastly increase RF sensitivity, allowing these affordable modules to communicate by themselves over the 100km+ distances required for tracking HABs. This dramatically reduces the cost of a receiver station with respect to RTTY, as well as reducing the effort required in the chase vehicle to maintain the receiver tuning. A vast range of data rates is available from 30bps to 30kbps. I'll be experimenting to find the best compromise between reliability and data rate. Binary packing will be used for best efficiency, perhaps using HABpack, a WIP standard based on MessagePack. 50 baud 7n2 RadioTeleTYpe is the tried-and-tested radio telemetry method for tracking High Altitude Balloons in the UK. This allows anyone with a Ham Radio 434MHz SSB Receiver to demodulate the telemetry, and decode it using a modified version of fldigi. More information on this can be found at UKHAS Wiki - Communication Protocol. The RFM98W is capable of transmitting RTTY, and so this will be used as a backup mode interleaved with LoRa packets. Electronics Board under Construction, running the Camera from 2x AA. 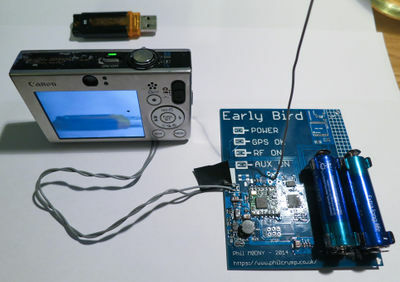 Single 2-layer PCB, designed to fit snugly in the box alongside the Camera. 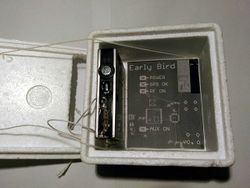 2x AA Batteries are connected using PCB Battery Clips. Tracks on the bottom layer have been kept short due to it's role as groundplane for the Transmitting Antenna. The 'Aux On' LED is unnecessary. The AVR Battery Voltage Divider should be 22K, 10K. Not 10K, 10K. The AVR Crystal Load capacitors should be 18pF. Not 22pF. The ADP1612 Feedback Voltage Divider should be 22K, 10K. Not 10K, 22K. This page was last modified on 2 February 2015, at 01:16.